n Monday 22nd June 2015, 162 of the UK's finest Junior School sailors arrived at Itchenor Sailing Club, for the JDX Consulting Junior Schools Championships. 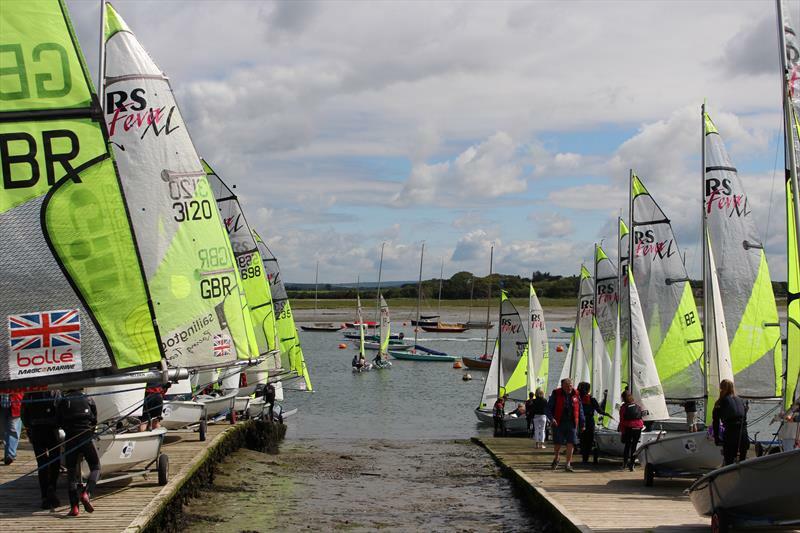 They were greeted by what was described by the locals as a vintage Chichester harbour summer's day, with changeable weather forecasts, promising a challenge for PRO Peter Taylor and his race management team. Race 1 got underway in 12-15 knots of Westerly breeze and a strong flood tide to keep the keen RS Fevas behind the line. In separate Gold and Silver fleets, racing proved to be extremely tight at the top and bottom of each fleet, with the lead constantly changing. After 2 laps of the long windward leeward course, the race was eventually won by Henry Chandler and Louis Johnson of Portsmouth Grammar School. Following a predicted wind shift to the South West, the race management team were forced to move race area to accommodate the exceptionally large fleet. In a freshening South Westerly breeze, race 2 got underway with Henry Chandler and Louis Johnson showing some superb tactical nous to control the fleet to secure another win. As the storm clouds rolled in, the wind picked up. With around 20-25 knots from the South West providing some exhilarating downwind legs for the crews, Henry Jameson and Ben Todd of Hayling College began to assert their dominance, winning race 3 and beating the black flag in race 4 to record back to back wins. Following the day's racing, all crews returned exhausted to the club to a well-deserved BBQ put on by Itchenor Sailing Club. Day 2 served up a further change of conditions for the junior sailors to contend with, including light winds and a strong flooding tide. Following a number of general recalls, race 5 got away into a north westerly wind, with Henry Jameson and Ben Todd taking the race win again, while witnessing great resilience from Piers Nicholls and Archie Grant; using their local knowledge to push them all the way to the finish. Race 6 got away in similar conditions with a shifty wind, providing a challenging snakes-and-ladders style conditions for the sailors. Henry Chandler and Louis Johnson played the shifts and tide extremely well to extend a healthy lead over their rivals, taking race 6 comfortably. Henry Jameson and Ben Todd wrapped up the event with a triumphant win and a solid 1st place, leaving Henry Chandler & Louis Johnson and Louis Wright & Jamie Allen to battle it out for 2nd place in the final race of the day. Peter Taylor and his race management team did extremely well to get race 7 away in a dying breeze following a number of general recalls. Henry Jameson and Ben Todd gave no respite to their opposition, taking a dominant win to complete the event with four wins and three 3rd place finishes, Harry Chandler and Louis Johnson took second from Louis Wright and Jamie Allen who had a tough final race finishing 10th. In the Silver fleet, racing was equally intense with Hayling College again taking the overall win with Joshua Boniface & Jessica Tame squeezing ahead of Ryan Wilkinson & Rachel Pyke in the final race. Itchenor will now gear up for a further 3 days of racing where 60 boats have entered for the Schools National Championships (older competitors). JDX Consulting have supported Junior Schools week since its inception, believing strongly in supporting young people in sport as they develop crucial life skills that are directly reflected and relevant in business. Sailing is a huge part of our firm. Our employees are always keen to get involved, as this sport is so close to many of our clients' hearts.